Visitation is by appointment only during one of three sessions. There is a limit of three approved visitors per session. Visitation sessions are Saturdays: 8:30 – 10:30 a.m. or 1:30 – 3:30 p.m. and Sundays 1:30 – 3:30 p.m. Visits are scheduled on a first-come, first-serve basis. To schedule visits, call Monday, Tuesday and Wednesday from 7:30 a.m. – 4 p.m.
To visit inmates in minimum custody, call 252-826-0051 or for medium custody, call 252-826-4967. Note: There is no visitation on holidays, unless the holiday falls on a regular visiting day. Special visits: All requested weekday special visits are for immediate family members only. To request a special visit appointment, call the facility you wish to visit at least 24 hours prior to the date of the desired visit (see numbers above). Visits will only be granted between 8:30 a.m. – 4:30 p.m.
Take I-95 Halifax County. Exit onto N.C. 481. Take N.C. 481 east for about 18 miles through Enfield to Tillery. 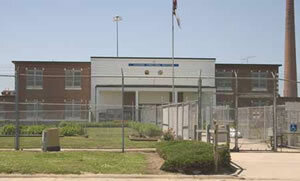 At Tillery, take State Road 1141 to Caledonia Correctional Institution. The Minimum Custody facility is on the left. The Medium Custody facility is about another quarter-mile down the road. .
Caledonia Correctional Institution is located in Halifax County on approximately 7,500 acres that was purchased by the state in 1899. It has been operated since 1892 as a state prison farm. About 5,500 acres of farmland are under cultivation at Caledonia. Correction Enterprises manages the farm, which contains cattle, chickens and crops such as corn, wheat, cotton and soybeans. In addition, the inmates farm 300 acres of produce like tomatoes, sweet corn, collard greens, sweet potatoes, squash, cucumbers and melons. During the offseason, produce is grown in greenhouses. Inmates also work in the prison's cannery. The cannery processes and cans crops grown on the farm for distribution to prison kitchens across the state. It is 12,770 square feet and has the capability of canning about 500,000 gallons of commodities per year. Inmates may also work as janitors or kitchen help. Halifax Community College works with the prison to provide vocational classes like cooking, block masonry and plumbing. Inmates may participate in classes for adult education and preparation for the GED. Inmates may also take part in self-help programs on substance abuse, stress, Narcotics Anonymous, Alcoholics Anonymous, DART aftercare, minimum custody readiness and self-improvement. With the intent of putting inmates to work, the General Assembly leased the Caledonia farm in 1890. Nine years later, the property was purchased for $61,000. Roanoke River flooding damaged the farm in 1901 and 1902. In 1919, the prison farm was auctioned in parcels that raised $497,000. However, the auction did not raise more cash because most of the land was purchased on credit. Flooding problems continued to plague the area and most of the farm was repossessed by the state within five years of the auction. About 600 inmates were returned to the prison and housed in temporary wooden shacks. They cleared the land for farming. In 1925, construction began on a brick dormitory. Inmates moved into the building in 1927. Heat and hot water were provided in 1929. Caledonia's main building originally housed men and women. Eight downstairs dormitories housed men and two upstairs dormitories housed women. Today the dorms house medium custody adult males. In 1976, 144 additional cells were built. These cells currently house medium custody adult males. Another 142 cells built in 1980 are used to house medium custody inmates. The prison also has buildings for vocational classes and recreation. In August 2014, Tillery Correctional Center merged with Caledonia CI and is now known as Caledonia Minimum. This prison was originally built to provide minimum security beds for inmates working at the state prison farm when Halifax Correctional Center was a medium security unit. (Halifax was later changed back to a minimum security prison and eventually closed in 1996). In 1987, the General Assembly provided for creation of the prison with a 208-bed dormitory as part of a $28.5 million Emergency Prison Facilities Development program. Another 208-bed dormitory was added by lawmakers as part of a $55 million prison construction program in 1989. Caledonia Mimimum sits on a 20-acre site about a quarter-mile from Caledonia CI. It houses inmates in two buildings, each with four dorms, connected by a central multipurpose area. There are six additional buildings, including an administrative building, program support building, dining hall, vocational building and multipurpose building. Inmates work on farm crews at the prison farm. They may also be assigned to maintenance or janitorial duties at Caledonia Medium. Inmates may work on labor contracts and manual labor jobs for local governments. Other inmates work in the prison as food service help.